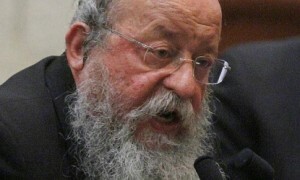 MK (Yahadut Hatorah) Menachem Eliezer Moses admits he is concerned due to the split in the litvish community and the split in the Sephardi Shas party. Moses states he is nevertheless trying to remain optimistic, but he warns the chareidi tzibur may lose significant numbers in Knesset. Moses spoke of the videos that have popped up without mentioning Shas by name, adding “go now what rabbit they will pull out of the hat on the eve of elections”. Moses added “I oppose the insults and humiliation. Far be it from me to get into this. I hope they find something. Don’t think we are just sitting here with our hands crossed”. All you have to do Mr. Mozes, is to make up with Reb Shmuel shlit”a and bring this bitter argument to an end. Stop the incitements once and for all. If you lose the elections, you only have yourself and your bnei brak buddies to blame. I don’t feel sorry for you !!! Enjoy the fruits of your labor. Of course the Hareidi will lose seats. There is now a serious “Hardal” party for the first time. Unless some factions slips below the threshold the totals of all Hareidim and Religious Zionists will be about the same as before. Coalition wise, Yahadut ha-Torah and Shas have an easier time threatening to ally with Labor since Yachad has removed their nationalist elements. Technically the frum parties might have more seats this time around. If Shas can pull of 8 (as some polls show online, not YWN) and Gimmel can get 7 and Yachad can get 5. That would be 20 seats. even if Shas gets seven that is more seats overall then the previous knesset. And even if they end up with 15 combined seats, they are still better off if they can actually get into the government and do something. That is better than 18 seats in the opposition. the whole Klal the world over religious ,irreligious ,those who appreciate what you’re doing,and many more of those hardly appreciate it, on your shoulders 24 hours a day 7 days a week without any breaks. You’re only hope in this world, is that after your demise you will then be (fully) appreciated . Contrary to popular aura,being a manhig hador is the most rewardless horrid job. But he invariably insists and has always insisted,even when offered, he is uninterested in being a leading manhig .